Secret conspiracies are trying to take over the world. You probably knew that already. We can say no more . . . THEY are listening . . . It's 2017 and everyone is talking about . . . conspiracies. 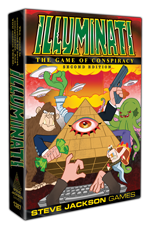 In this new game from Illuminati designer Steve Jackson, each player takes turns acting as the Judge to read a card outlining a conspiracy. Then the other players choose from their own cards, competing to create the wildest, silliest, or most believable theory. Every turn, each player tries to convince the table, and the Judge, that THEIR conspiracy is the truth. Fun for everyone who is old enough to read the news and wise enough to know that there's more they're not telling you . . . Now YOU get to decide what's behind those stories. Men in Black, esoteric phenomena, and High Weirdness – we've published a wide variety of books on conspiracies, complete with GURPS mechanics, and free of subliminal messages . . . right? Explore a magical organization that influences multiple worlds in Cabal. Build your own puppet masters based on actual history with Illuminati. Discover what's in The Crates Man Was Not Meant To Open with Warehouse 23. Just remember: you're only roleplaying a paranoid. Our vast line of Illuminati Pins lets you discreetly signal your position in the global power structure. INWO is the trading-card version of Illuminati. It won the Origins Award for Best Card Game of 1994. Hundreds of different cards are available, and two expansion sets. If you like deck-building games, you may find this is your preferred way to take over the world. INWO SubGenius is a hundred-card non-collectible set. Play using only the SubGenius set, or combine the cards with any other INWO cards. The warm glow you get after drinking from this shot glass may be Illumination. Or it may not be; it depends on what you're drinking . . . The Eye-in-Pyramid Shot Glass features the classic symbol of illumination on a 1.5 oz black glass, perfect for [FNORD] across the [REDACTED] or taking [CENSORED] when you're [FORGETABOUTIT]. Or you could just drink out of it.